Aspire coils are the heartbeat of all Aspire tanks and here at Official Aspire, we produce some of the best in the industry. 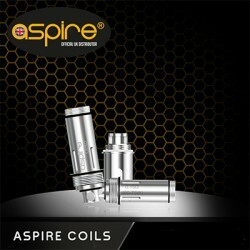 Aspire coils power devices from standard BVC coils, all the way up to high wattage sub ohm coils. They are smart e-cigarette components that have a heating element. When Aspire coils are heated, a cotton wick soaks up the e liquid and converts it into a vapour – making vaping more enjoyable for you. We provide a wide range of replacement coils for the Typhon, Breeze, Nautilus, Cleito 120 and many other popular Aspire tanks, so you needn’t worry about finding the right coil for your tank. At Official Aspire, we provide Aspire coils to suit the demands of both beginner and advanced vapers. It’s important that you choose the right coils for your hardware to ensure that it is powered effectively. Our team of experts are always on hand to help and can offer guidance should you need assistance choosing Aspire coils. The Aspire Cleito Mesh Coils are used to power the Aspire Cleito Pro tank. It’s these Aspire coils that provide power for your tank and deliver amazing clouds and flavours. When it comes to keeping your Aspire Breeze tank full of flavour, why not consider the Aspire Breeze coils? We provide the Aspire Breeze coils in convenient packs of 5. As with any of the products that we supply, the Aspire coils are available for wholesale prices – providing you with the best value for money. If for any reason you can’t find what you’re looking for, it may have been discontinued due to TPD regulations -please call us on 0333 577 5002 for clarification. 5 Pack of Aspire Breeze Coils The power behind the amazing Aspire Breeze kit to keep your device .. Aspire Revvo Coils The Revolutionary ARC (Aspire Radial Coil) that powers the amazing Aspire Rev..
Cleito 120 Mesh Coils Finally available after being demanded for so long is the unreal Cleito 120..
Nautilus 0.4ohm BVC Coils Presenting our newest member to the Nautilus family of coils. The 0.4 N..
5 Pack of Spryte Nic Salt BVC Coils. These coils have been designed for use with Nic Salt E-Liqu.. Aspire Atlantis Evo Coils The coils that powers the latest Atlantis Evo tank from Aspire. They co.. Aspire Cleito 120 RTA System IN STOCK NOW - Due to popular demand, Aspire has released t.. Aspire Cleito EXO Coils The amazing coil behind the power of the Cleito EXO tank! 0.16 ohm of ..
5 Aspire PockeX Coils The amazing 0.6ohm & new 1.2ohm MTL coil that fits the brand new Aspire.. Aspire Revvo Boost Coils Designed for use inside the award winning Aspire Feedlink Kit. The Re.. Aspire Tigon Coils. The awesome Aspire Tigon Coils, launched with both the Aspire Tigon Kit and t.. Aspire Cleito Mesh Coils - 5 Pack Our first mesh coil had to be for the much loved Clei.. Aspire Cleito Pro Coils - 5 Pack The latest addition to the Cleito coil family was introduced wit..
Clapton Coils for Cleito RTA Grab a pack of 6 Pre-Built Clapton coils for the Cleito RTA system. ..
5 Pack of Aspire Cleito Coils. The Aspire Cleito coils are designed to power the Aspire Cleito ta..
5 Pack of Aspire Triton Mini Clapton Coils. The power behind the Triton Tanks enhanced by Clapton.. Aspire Cleito RTA System. This easy-to-build Cleito RTA has a dual coil velocity-style deck. It h..